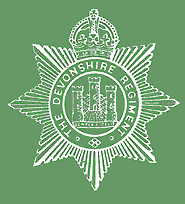 The Badge consists of an eight pointed star in silver, the centre enscrolled “The Devonshire Regiment”. Within the scroll is the Castle of Exeter (Rougemont Castle) in silver on a blue ground with the Regimental Motto, “Semper Fidelis”, underneath. In place of the top point of the star is the Queen’s Crown in gold. The Regiment was raised in 1685 by Henry, Duke of Beaufort, to quell the rebellion caused by the landing of Henry, Duke of Monmouth, in Dorset, and was known as “The Duke of Beaufort’s Musketeers”.